One of the prominent features of Microsoft CRM’s user interface is that all records are opened into a new pop-up window. While this does make navigation quite consistent throughout the different areas of the application, the downside is that it won’t take long before you have 20 separate browser windows open and you’re forced to take a break for cleaning up the taskbar. Internet Explorer 7 brought tabbed browsing into the toolkit of anyone who’s forced to work with IE due to their day-to-day business applications. This would be a nice way to control the clutter of MS CRM windows as well, but unfortunately this has not been possible for many users. I’ve seen numerous different client machines in different organizations experience the same bug: opening CRM pop-up windows in new tabs instead of new windows has spiked the CPU load up to 99% for no apparent reason. Finally, after 2 years since the launch of IE7, there is now a workaround for this bug. 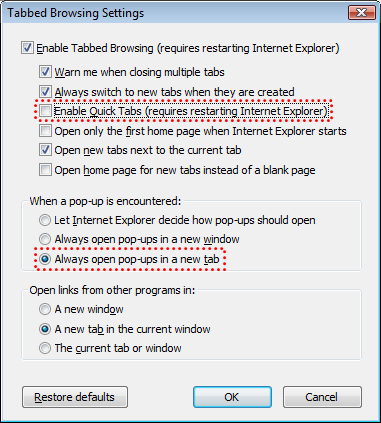 All you need to do is go to IE’s Internet Options – Tabs – Settings and uncheck the option “Enable Quick Tabs”. After that, you are free to change the pop-up setting to “Always open pop-ups in a new tab” and watch as Microsoft CRM diligently opens the records in the same browser window without any performance impact. Thanks to Joel Lindstrom for uncovering this on CustomerEffective’s blog.